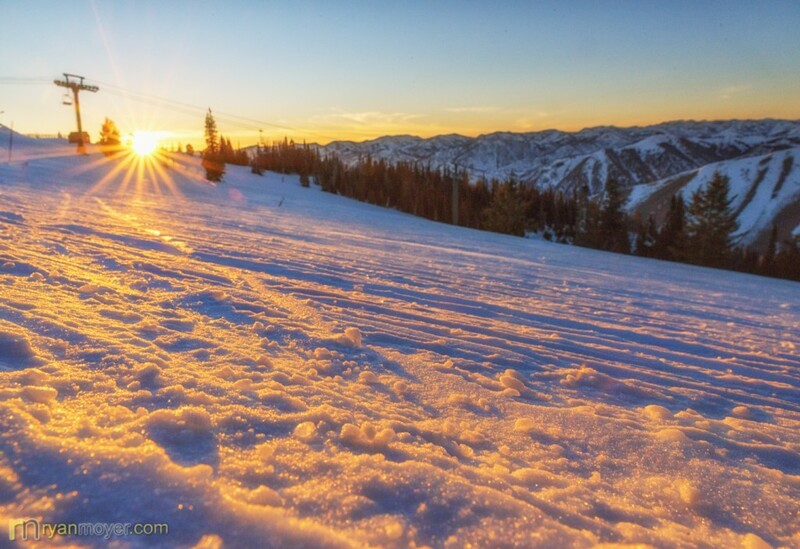 My season pass at Snowbasin Ski Resort comes with 3 free days of skiing at Sun Valley each year. This year, my wife and I once again made the 4 hour drive to Sun Valley to celebrate my birthday. Aside from some pretty good skiing, this also came with a unique opportunity. Inside the River Run Lodge at the resort are two iPads up on pedestals. On these, you can enter a contest (by signing up for a little bit of email spam) to go for an after-hours ride-along on the world’s largest groomer. 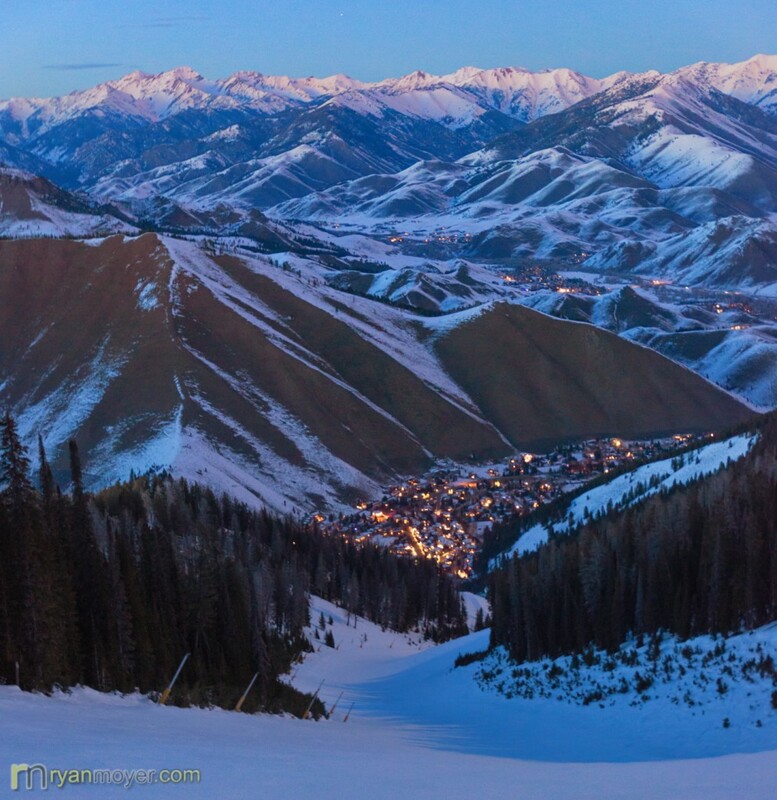 Or, as Sun Valley has coined it, to “Ride the Beast”. You don’t need to be skiing there to enter. 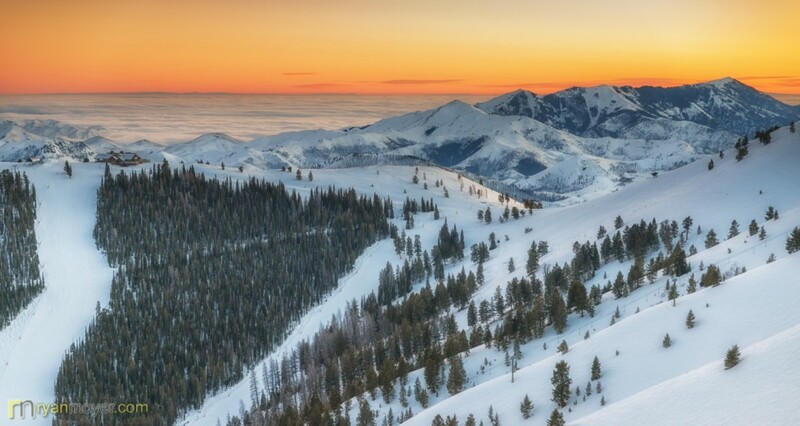 If you win, some great insight and incredible sunset/twilight mountain-top views await. 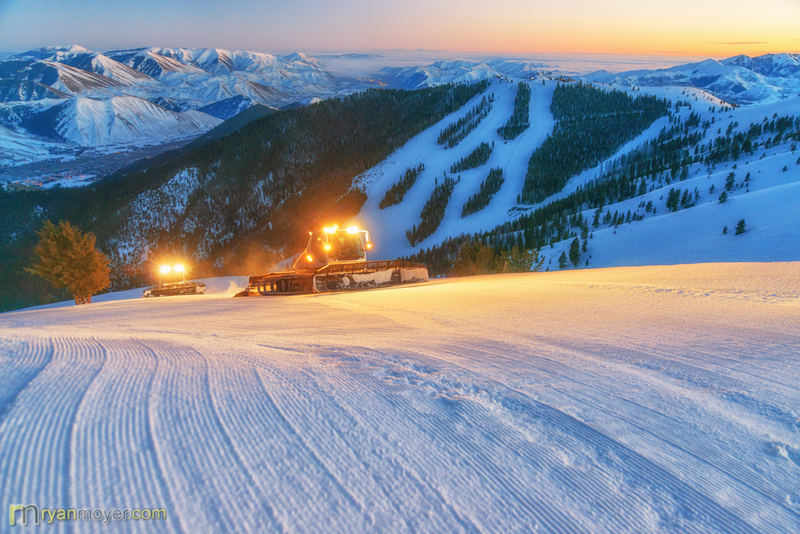 Sun Valley’s famous grooming crew goes to work as the sun sets on Bald Mountain. On our first day there I noticed the iPads and signed up. A few hours later, after a day full of skiing, I received a call letting me know that I had been selected. 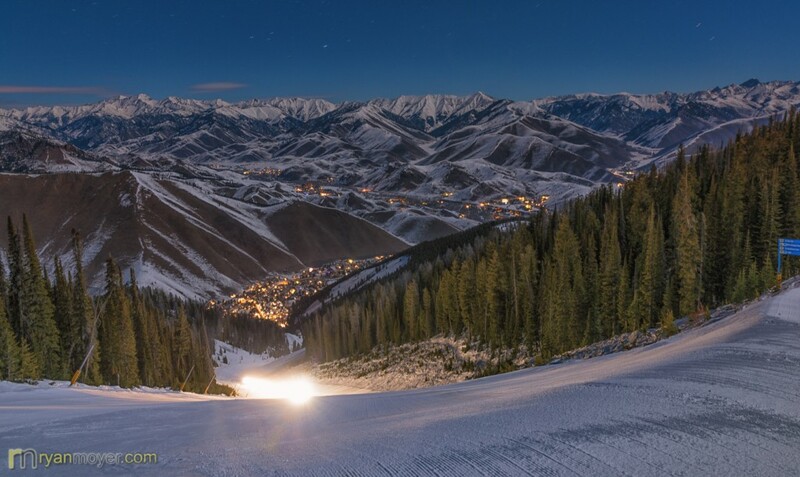 I don’t think there are a ton of people that enter, as Sun Valley offers two ride-alongs per night (only on weekends) and I was told I could bring someone with me to ride in the other groomer if I wanted. My wife Stacie declined, so it was just me. I was instructed to meet at the mountain operations building the next day at around 4pm and was told I could ride along on the groomer for as long as I wanted, with most riders choosing to ride until about 7:30 before being dropped off mid-mountain at the top of the gondola. After another bluebird day full of skiing, I went to the building and met the other contest winner, and we got going. One of the many sunset views awaiting me at the top of the mountain. Things started with us sitting in on the daily grooming meeting. This is where each of the first shift’s seven groomer operators meet and discuss there plans for grooming the mountain that night. The groomed runs are pretty consistent from day to day so this mostly entailed discussing the conditions of those runs (IE a center high run that needed to be flattened out) and the plan of attack. These guys have all been at it for a long time, with the least senior operator having been a part of the team for a decade, so they are all on the same page and the gameplan remained pretty casual. Like a football team that’s been playing together for years, each knew where the other would be and where help was needed without micro management. From there, it was time to hop into the groomer and get going. I rode along with Jeff, who first started grooming at Sun Valley in the mid 70’s. He was a great ride-along partner, answering all my questions and preventing some incredible insight and knowledge on the process. He was also very amenable to my desire to get out and shoot photos, altering his plan so he could drop me at good photo spots and swing by to pick me up soon after. Looking west from one of the spots that Jeff dropped me off. The grooming fleet is made up of two of the large groomers (the “Beasts”) and five smaller ones. Along with the other beast, we headed up the main River Run ski trail to get to the peak of Mt Baldy, grooming it on our way up. At the top, Jeff kindly pointed out some of his favorite sunset spots and let me out, armed with my camera and new Gitzo Systematic Tripod. This was my first real shoot with my new gear, so I was excited. While I shot, he and the other Beast got to work grooming Christmas Ridge, a blue run that goes from Baldy Peak down to the mid-mountain area. The scenery did not disappoint. One thing about being on the peak of a mountain at sunset is that there are views in every direction. It was difficult to pick a favorite. While the sky was clear up here, there was some fog down in the valley of Hailey that looked like an ocean of white from up at on the mountain. 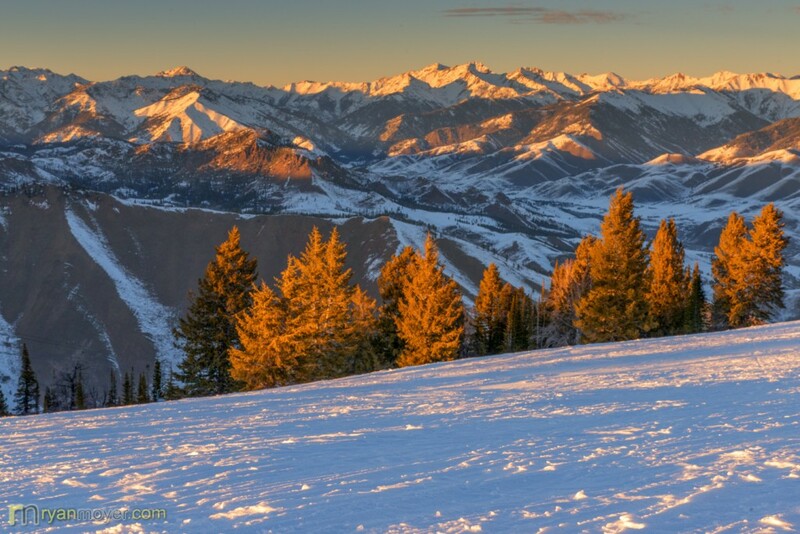 To the east, the unblocked sunlight turned from yellow to orange to pink on the Sawtooths. Seattle Ridge Day Lodge on the top of the mountain, out of the fog. As sunset gave way to twilight I focused on bringing objects into the photos. The ski lifts and the groomers themselves made great targets. After the sun faded, I hopped back into the Beast with Jeff and rode around a bit more, learning a lot about the process. As 7:30 neared, I decided I wanted to hop out one more time and take some late twilight/night shots. At this point we were about half way through grooming the main Warm Springs run on the west side of the mountain. I thought it would be cool to try and capture a long exposure with the light of the groomer moving up the ski trail. I told Jeff my plan and we set it up. I had a few minutes to kill while Jeff headed downhill, which I probably should have used to make sure I was set up in time for his ride back up (where I would be taking the picture). Instead, I wanted to see the view from the top at night. The problem was, it was so beautiful on this moon-lit night that I spent a little too much time up there, and had to rush back down a little ways back to my photo spot. While running uphill on a ski hill in boots isn’t that difficult, running downhill is an entirely different story. Slipping and sliding the whole way and feeling like I was about to roll 3000 feet down the hill, I eventually made it. It was difficult to capture the shot I wanted as the groomers move pretty slowly and I didn’t have an ND filter with me, so I was limited by exposure time. This exposure I believe was about 80 seconds long, and I went ahead and closed it off before the groomer got too close as the lights on it, of course, are very bright. I was very happy with the result. The Beast heads up Upper Warm Springs run. From there, Jeff graciously dropped me off at the top of the Gondola, where I grabbed a few more shots down Lower Canyon run before before riding the gondola back down to complete my journey. Looking down at Warm Springs base area. All in all, I came home with both some great memories and some fun photos. 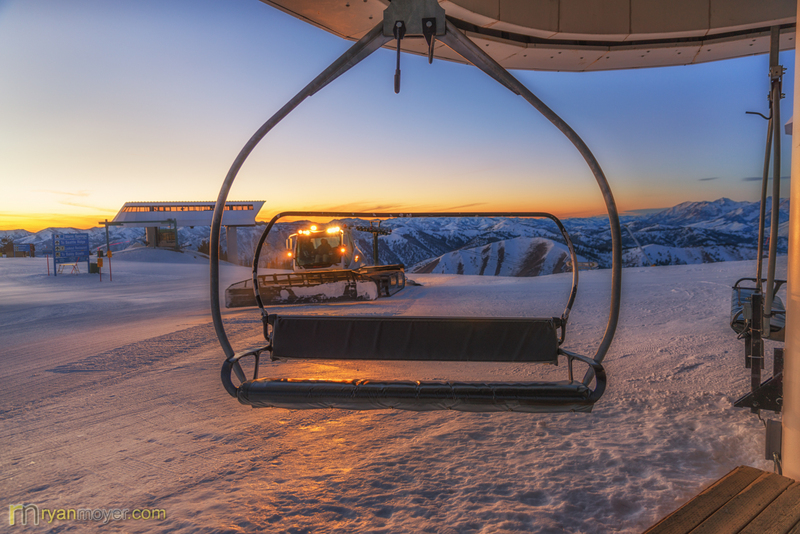 I’ve often lamented that ski lifts shut down so early because the views at sunset and at night would be amazing. Riding the Beast provides a unique opportunity to see both, and it did not disappoint. Gorgeous pics! I grew up in Boise and spent a lot of time up in Sun Valley as a kid. This certainly brings back memories! Thanks Kristen, it’s an amazing area for sure, we try and get up there at least once every year! Love your site!